Martha Stewart and I regularly go to blows. I don’t know why, but I can’t make a cookie recipe of hers to save my life. This cookie began life as one of her peanut butter sandwich cookies. And as usual, my right eyeball began to pop out of its socket, and my eyebrows hit my hairline when I realized there was no way this recipe of hers was going to come together as planned. Again. I barely restrained myself from beating this dough about the head and shoulders, once I realized something so crumbly didn’t have a prayer in hell of being rolled out as per the instructions. These were City Hall cookies, they had to be done, and I didn’t have time to make another batch. So I grabbed my mini cookie scoop and started packing in this crumbly mess of a “dough”, and turned it out onto parchment in half rounds. Not daring to disturb the mounds, I just baked them that way. After the dough came out of the oven, I dipped the underside of a dry measuring cup into some sugar and flattened them slightly. What I was left with were the best darn little peanut butter oatmeal cookies I’ve ever tasted. Holy moly these little chubbies are tasty. Martha Stewart got it half right. Or maybe I got it half right. Either way, I just want another cookie, or five. 1. In a large skillet melt 1 stick of butter over medium heat. Add the oatmeal and cook, stirring often until toasted. About 5 minutes. Pour oatmeal onto a baking sheet and cool completely. 2. After the oatmeal has cooled, line a of couple baking sheets with parchment paper. Preheat the oven to 350 degrees. 3. In a stand mixer add 2 sticks of butter, granulated sugar, and brown sugar and beat on medium high speed until fluffy; about 2 minutes. Add the peanut butter and beat until fluffy again. Add the salt and baking soda and beat until combined. Add the oatmeal and beat until incorporated. Add the flour and mix until just combined. 4. With a size 60 mini cookie scoop, pack in the dough with your hands. Turn the dough out onto the cookie sheets about an 1 ½” apart. Bake for 9 to 10 minutes. 5. Meanwhile, set aside a small bowl of sugar and a dry measuring cup bigger than the cookies. Immediately after removing the cookies from the oven, dip the back of the measuring cup in sugar and flatten the cookies slightly. Re-dip into the sugar about every third cookie. 6. Let cool on the cookie sheets a couple more minutes, then move to a cooling rack to finish cooling. Martha Stewart recipe heavily adapted by Laura Flowers. I notice you indicate 'heavily' adapted. :) These look great! I like a chunky cookie. I haven't tried any of Martha's cookie recipes that I can remember, but these little suckers sound good, especially with your adaptations! Prepare yourself to wince. "All's well that ends well." Great recovery from a difficult situation. They looks terrific. I've never made any of her cookies. Does she weigh her flour? Maybe it was missing an egg? In any regards, I'm thrilled to find a new peanutbutter recipe, thanks for posting. LOL...i have issues with some of marthas recipes too! Your "fixed" cookies look great. Uh oh... does this mean I wasted my money when I bought her cookie book? Glad you were able to make this recipe turn out. Sounds like a good one for the lunchboxes. Too funny! One day I'll tell you the stories I heard from a guy who worked for her once.... You'll laugh. 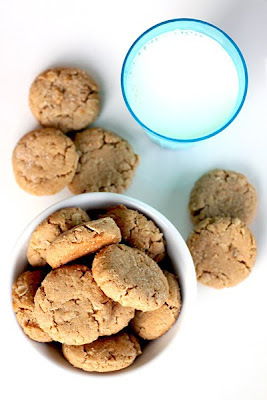 I love peanut butter cookies and I'll trust you on this! Sadly, I am the only one in my house who eats them. Oh well, more for me! Laura, I hate when that happens... but you did the cookies proud, thanks to your experience. I would love 2 or 5 right about now, please. They look DELICIOUS! I'm a bit late in posting (was out of town -- not that you care) but those cookies look amazing. I wish I weren't a food addict. I may have to make them regardless. Under the guise of feeding "company" of course. Lol "feeding company". I do that all the time. I ate a lot of these things. Chubbies! What a fun word! These look so goooood. Gotta try em! Thank-you for the comments everyone! I've enjoyed reading them. I'm glad I'm not the only one having this issue Krista! Ugh although I am so sorry about your cupcakes. It's frustrating to have something you spent money and time on turn be garbage. I tried these, ande while they are pretty crumbly, they taste awesome. Great recipe, even if it is not what it was supposed to be! I had no idea anyone was looking down here. Thanks for telling me, that was so fun to read! I just tried these, and perhaps because I live in a very humid place, they weren't crumbly until AFTER I baked them. Dangerously so. The addition of a couple of eggs fixed that problem, though, and I ended up with wonderful tasting cookies. Thanks for putting in the recipe.